Next, Envaya will ask you a couple of questions to make sure that your organization qualifies to use Envaya. 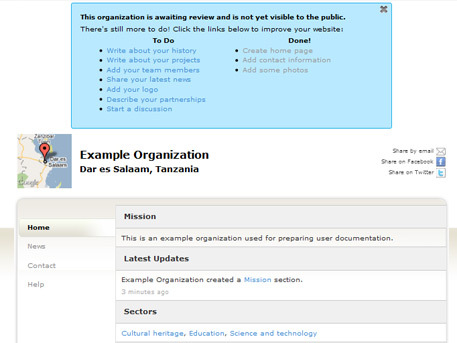 Click the appropriate answers for your organization, then click the blue button at the bottom of the page. 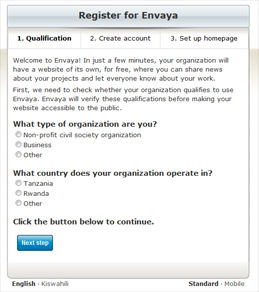 If your organization qualifies to use Envaya, the next page will let you create an account for your organization. On this page, you will need to enter your organization's name and contact information, and choose a username and password for your organization on Envaya. For your username, you should enter a short name or abbreviation for your organization. 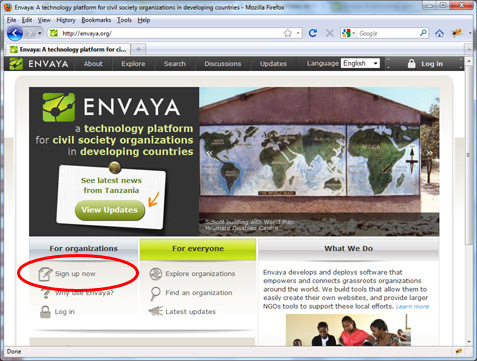 The username will be used to determine your organization's web address on Envaya. For example, if your username is jeanmedia, your web address will be http://envaya.org/jeanmedia. For your password, choose a secret word or phrase at least 6 characters long. Together with your username, the password will let you log in to edit your organization's website. Remember your password and only share it with people who are allowed to edit your organization's website. If your organization has an email address or phone number, Envaya may use this information to contact you, such as verifying your organization, helping you if you forget your password, and contacting you about new updates with Envaya. When you have entered all the information, click the blue button at the bottom of the page to continue. If there are any red error messages at the top of the page, correct the errors and then click the blue button again. The final step in registering your organization is to enter some more information that Envaya will use to create an initial homepage for your organization's website. 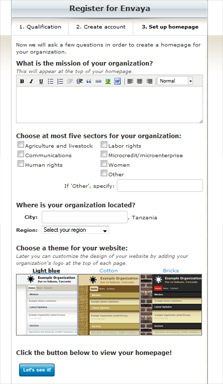 Follow the instructions on this page to enter your organization's mission, choose up to 5 sectors to categorize your organization, enter the city and region where your organization is located, and choose a design for your website. When you are done, click the blue button at the bottom of the page to create your organization's website. If there are any error messages in red, correct the errors and click the blue button again. Finally, Envaya will take you to your organization's new website. Envaya's administrators will be notified that your organization has registered, and they will need to approve your website before it appears publicly, to make sure that your organization qualifies to use Envaya. If you entered an email address for your organization, Envaya will send you an email when your organization's website is approved. Even while your organization is awaiting review by Envaya's administrators, you can continue editing your website and adding other pages and information about your organization, as explained in the following pages.